NOTE: Want to know how to think like a successful freelance writer? It’s starts with getting a few things straight, beginning with this advice I shared a while ago. Enjoy! —Carol. The Internet has brought us many gifts, as freelance writers. But it also brings with it a lot of misinformation and confused notions as to how to go about building a successful freelance writing career. If you make assumptions off the bat about how freelance writing works, you can waste a lot of time and energy. Frustrated? Confused? Spinning your wheels about how to be one of those successful freelance writers? Let’s iron this out right now. Writers think of themselves as creative people. But if you want to earn a regular living at writing, you’ll need to be more than just creative — you need to run a business. One that turns a profit and brings in enough cash to pay your bills. In my experience, only a tiny percentage of freelance writers truly grasp this reality. Most don’t want anything to do with business — isn’t that why we quit our day jobs? Business minded or in la-la land? It’s so much more pleasant to live in a world of magical thinking, where great clients who value your talents will somehow materialize without any effort on your part! When you think you’re not in business, then you don’t think you need to invest in your business, either — with a better website, mentoring, or training to sharpen their skills or learn new ones. Then, writers wonder why they can’t seem to get any good gigs. Bulletin: There is no well-paid writing gig like that. One of the big reasons writers get hired is for their ideas — whether it’s article ideas, or topic ideas for a business blog, or ideas on the best angle for a case study or white paper. Instead of sitting passively, hoping a pre-packaged assignment that doesn’t require thinking will fall in your lap, treat your writing like a business. Service providers — which is what we are — need to bring ideas to the table. Then, it’ll pay you like a business. Treat it like a creative lark, and you’ll soon be stocking shelves on the grocery night shift to make ends meet. Do you think you’ll feel ready to jump into freelance writing after you read one more book, take one more course, or get a master’s degree in journalism? Bad news — you’re probably still not going to feel ready. I know, because I’ve mentored writers with more than one advanced degree, who still feel they need one more class. There’s always more to know. Accept that and realize you’ll need to be taking action while you learn. You’ll never feel confident and “ready” to do this by studying freelance writing in an ivory tower, or at home by your lonesome. Do this instead: There’s only one thing that builds confidence in writing for clients. You guessed it: writing for clients! You need to get out and start doing it, as fast as possible. The more you take action, the more you’ll realize you already know enough to get started. The longer you study and do nothing, the more disempowered and afraid you’ll feel. Your list of degrees or certificates earned does not impress prospects. Only your published writing samples (ideally, accompanied by a testimonial) will get you hired. Do a few assignments pro bono at first if you have to, but get out there and start writing for clients! The vast majority of writers do not have any overflow work. And those few who have more work than they can handle refer out projects to writers in their network, whose work they know well. Not total strangers. Well-paid writers tend to get hired because of their body of work — we can’t just sub out that work to a new writer off the street and expect our clients won’t notice we’re no longer writing their assignments! Writers are not your client. Your client is usually a publications editor or a marketing manager at a business. Don’t waste time daydreaming that you’ll be able to ride on another writer’s coattails. Instead, review points 1 and 2 above for a sense of how to get your career moving. If you do a search for “Freelance writing,” and don’t know any better, it’d be easy to assume the top results must be the best places to freelance. This is why so many writers sign up on UpWork. Months later, they wonder why they’re living in their car. As long as you answer mass job ads on popular sites, or bid against thousands of other writers, your success odds will be long and your paycheck is apt to be tiny. You’ll need to actively market your business to prospects you identify yourself — where you’re not one of hundreds of writers going after the gig — to find professional pay rates. 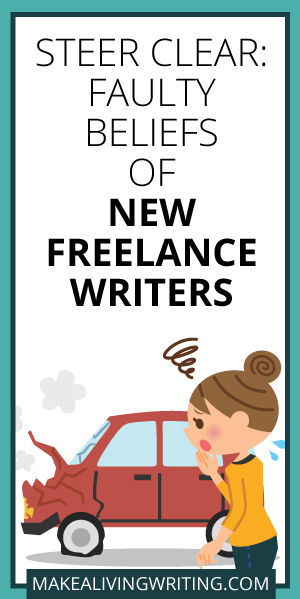 Most good-paying freelance writing jobs are never advertised. They’re not waiting around for you on a website thousands of other writers also read. There are lots of ways to market your writing — through social media, in-person networking, writing killer query letters. Take your pick. But understand that you are in the driver’s seat of your career, and you will need to make things happen (or they won’t). You’ll need to do more than responding to online job ads. Because that’s super-easy, right? And if it was easy to be a freelance writer, then everyone would be doing it, and no one would have a job anymore. Since freelance writer = awesome. I hear regularly from poets, memoirists, playwrights, novelists, and screenwriters who’d like tips on how they can pay the bills with their craft. While they might hit a moonshot success and be rich one day, these are not types of writing that reliably pay this month’s mortgage, especially when you start out. The same thing goes for topics. I’ve met new freelance writers who’re hoping to earn a living writing entirely about missing persons, a specific disease or mental illness, or by just writing executive bios. If this is you, you’ll probably need to broaden your focus to make it a living. What can you get regular paid writing gigs doing? Mainly, writing for businesses (both informational and sales-focused materials), and writing reported nonfiction articles for publications. That’s the bulk of it. I don’t want to discourage anyone from pursuing their long-term writing dreams — but realize that if you want a reliable living as a writer, you’ll need to add some other writing types or topics to your skills. Pre-writing and sending in article drafts instead of writing a query to ask for the gig first. Not getting paid because you didn’t ask about a contract. Getting an article killed because you didn’t inquire about the required specs. Not asking your writer friends if a gig sounds like a scam. Writing with only a vague notion of what a copywriting client wants — and getting fired. In fact, pro freelance writers ask tons of questions up-front. That’s how we turn in first drafts that our editors love. I can tell you what worked for me, but it won’t necessarily work for you. Because you’re not me. I might find clients at in-person networking events, and maybe you wouldn’t be caught dead at one. This is a career where who you are, where you’ve worked, what you’ve lived, and who you know are all key components of what you offer. Prospective freelance writing clients respond to each of us differently. So, for the record: There is more than one way to do this. Instead of starting when you find the one, true way, realize it really works in reverse — you’re only going to find the right way for you by starting. I recently interviewed a six-figure freelancer who makes most of her money cranking out dozens of low-paying, short keyword-focused posts for online publication. I wouldn’t do that on a bet, and I’d probably last a week if I tried it, but it works for her. See what I mean? Does this last point mean you should disregard some of the advice I just gave you, in points 1-6 of this post? Possibly, if it doesn’t ring true for you. Trial and error. Begin conducting experiments and asking questions, and you won’t be a noob without a clue for long. What assumptions did you have when you started writing? Let’s discuss on Facebook and LinkedIn. I still tend to fear to be a bother when I ask many questions before I start drafting, but I’m trying to get rid of this concern because clients seem to love it when I ask questions and I really want to understand what they need, without guessing. Luana, by your definition I’m not a real journalist, even though I’ve written for Entrepreneur and Forbes! It’s incredible the rules we make up in our heads to disqualify ourselves from getting to do things. And I ask loooooaaads of questions. 😉 It’s not a bother — it’s being professional. These are so much excellent advices! I was reading it and identifying myself in many cases. I think you are definitely right about the fact that in order to succeed we just need to start writing, succeeding and failing, making experiments, until we find our way. I am going to remember that and work on it. I always wanted to be writing for big magazines and websites, and I think it’s time to start. Thank you again, and keep the great work Carol 😉 ! Oussama recently posted…How The Economic Globalization Has Been Done Wrong? Excellent post! I made some of these mistakes myself when I started out freelancing last year. Now I’ve learned a lot and am on my way to earning a lot more too. I assumed I wasn’t good enough to write, and although I have intentions of writing a book I’m sharpening my teeth on blogging first. However, writing is becoming a 1000 word a day habit for me, I just need to improve the quality. Thanks for sharing this timely post. I didn’t have a clue when I started out. I googled “freelance writing” and ended up making $5/500 words on my first 10 assignments from freelancer. I moved “up” to Elance and made $10/500 words there for nearly a year. Someone recently asked me how they could get started. I recommended your site, but also gave examples of what worked for me. Basically, it boiled down to not being afraid to pitch an idea. Before I had to make steady money freelancing, I did that occasionally and got articles accepted by publications I never dreamed would accept work from an unknown, inexperienced freelance writer. Now that I’m making decent money, I do that again occasionally. What a great list. I’ve been guilty of #1 and #2. I’m in a pickle right now because of #1. I wrote a children’s book, self published it, stuck the link up on the sidebar and forgot about it – very business like, NOT! Last week, an email rocks up – a nonprofit wants reprint rights…for 25,000 copies. Now what? I’m just a little ole freelancer, what do I know about reprint rights? Carol, where are you? Help? Have to say I haven’t done a ton in reprints…it WOULD be a great time to tap a 1400 member community, hm? It’s a nonprofit, so I’d run on the assumption they’re not going to pay a lot. But since it wasn’t selling…see what you can get. Ask what they’d offer. Thanks Vivinne! I’m surprised you remember! My comment won’t go through with a link in it, but if you wanted to check out the post that interview was based on, it’s called “Turn Your Biggest Disadvantage into Your Biggest Strength in 5 Easy Ways” and is up on The International Freelancer. These are really some of the things that usually limit people from getting to their goals both in freelance writing and in every works of life. Especially the issue of having the notion that you’re not yet ready and that you still need more lessons before you start, anyone who is still having this notion will never start while he is waiting to be ready. There is no right time other than right this moment. That’s right, Theodore — as they say in Rent, No day but today. Like many of the others commenting #2 is definitely the one that really resonates with me. If I just do this course, or complete this assignment… I write a blog for freelancers and #1 is common too – people want to work for themselves for all the right reasons but forget that they are running a business and that they need to do all the marketing/promotions/IT etc. I love the comment above about ‘See 1, do 1, teach 1’ – I think I’ll adopt that motto next time I’m getting hung up on needing to learn more. #2 is me! I’ve been in the writing business for a few years now but I still can’t shake off the concern that I don’t know enough. Sure, it does keep me constantly learning but there’s always that uncomfortable feeling that I’m not good enough. Hope it’ll go away as I get more experienced. What you’ll learn is…give me 24 hours, and I’ll BE your expert. In anything. We have the Internet now! Information is NOT hard to find. You’ve listed some amazing faulty assumptions in your post. Come to think of it, we are all business people and we ought to strive to satisfy our customers/clients, after all, it’s said that he who pays the piper dictates the tune. So for me I’ve actually started at lowest end content mills (awful just as you say,) because I didn’t know any better at the time. But I’ve landed on Elance (which you don’t recommend and I’m not sure I do either.) It’s still a marketplace and I was terrified of being undercut by foreign & low cost providers. But I found a way (via a training program & smarts/drive) to use it as a stepping stone upwards. I honed how to do proposals and a few other things, and started getting hired at close to the rates you recommend. In the meantime while that gave me some bread and butter-I began creating my writers website. Because I’m skilled at SEO, I’m using that skill to rank my website, and I’ve gotten my first two calls. One was to be part of a guest post and the other was to propose on a potentially huge contract. I know you are right in terms of highest paying gigs- your training was excellent on “how to flee content mills,” and that shift in mindset really helped me plan out my own path! The next step is to use what you teach about querying and various more sophisticated methods to get well paying jobs. I love this! And #3 is sadly much too true. I get emails all the time from new writers asking for work. Even if I had an overflow– which I sometimes do– I wouldn’t pass it on to them, as you mentioned. Great post, Carol. A must-read for newbies! Mridu loved your podcast on “A Little Bird Told Me,” I think is name, you discussed turning negatives into positives and really opened my mind! And helped me around some blocks that were holding me back. You discussed how you turned around being an writer based in India (at the time) dealing with some negative stereotypes that could have impeded your career growth as a writer. #7 really hits home: I wasted the first several years of my career trying to imitate the success stories step by step, and got paid in less than $1,000/month and recurring piles of discouragement. There is a lot of solid advice in this article you posted about freelance writing. I hire writers from various sources. Once I find a couple of writers I like, I send them all of my assignments. Stick with a few of the good sources and do an excellent job for them and provide real value. You maybe get repeat clients or customers who put more money in your wallet. Was just talking to a dentist friend of mine about the #2 trap of “I’ll learn until I feel ready.” He said in dental school, the general approach to learning a new procedure was “See one. Do one. Teach one.” He said he was terrified to do his first root canal, even after studying the procedure inside and out, but did it anyway and all went well for him and the patient. If you’re trying to get your freelance career going, or grow your current business, it makes sense to “See One” like a well-written query, LOI, case study, website, etc. But if you’re going to make money at it, move on to “Do One” ASAP and keep learning as you go. Great article. I’m definitely guilty of 2 and 7. I also can’t seem to get past the chicken/egg problem were I think I can’t build a website, pitch an ideal client, or do anything else until I have more clips. Bryan — your website IS a clip. Write the heck out of it, and get pitching! We all pitch with what we have and add clips as we go. Remember, you’ll never feel ready. Just do it anyway. Coming up with salable ideas for publications has been such a sticking point, I feel like a broken record haha. I’ve realized my main issue is I’m not reading enough outside of business, writing and social media publications. So now I’m trying to mix things up – read more of the publications I specifically want to pitch and do some fiction writing fot myself for a fresh change and creativity boost. Been reading a lot about that. #2 (I’ll learn until I feel ready) has defo been my Achilles heel. But it hasn’t just been my weakness as a freelance. It was just the same when I was an employee. For several years working for one organisation I never once applied for promotion or for higher-paid jobs for other companies. I just didn’t think I knew enough to warrant such a position or salary. Then, before I knew it, I found myself being managed by people who knew far less about the job than me. Ironically, it was those less-experienced line managers of mine who had hang-ups about it NOT me. Anyway, fast-forward to becoming a freelance and I continued to make the same mistakes. Eventually, however, I got sick of just learning and got to a point where I just wanted to get on with it. Good Article. I especially like the notion that this is “work”. And that Freelancing is a business. From an artistic and creative point of view, those are hard words to read. But from a practical perspective, it is music to my ears. Thanks for helping us understand what it is we are undertaking and for dispelling the myths that surround our business. Thanks Carol, your fourth point looks so ME. I hope to shake that off. Hopefully, that gives you another reason not to rely on the top Google results as your source of freelance work! So much excellent wisdom here – especially the part about overflow work. I likewise get requests all the time from people I don’t know who would like my overflow work. Sorry, but I only outsource to other professional writers I know really well. When I connect a client with another writer, it’s MY reputation on the line. Elizabeth Hanes recently posted…Can a ‘Diva List’ Make You a Happier, Wealthier Freelancer? I know — I think the writers making this ‘ask’ are writing a lot of low-quality SEO posts, and think I might have some to parcel out to them. But I don’t write any projects remotely like that. My clients would know IMMEDIATELY if I was subbing out my work! And who subs their writing out to a total stranger? NO ONE. I just think it stems from the hope writers have that they won’t really have to do marketing, and they could just get in another writer’s downline. But freelancing doesn’t work like that. So true Elizabeth, I honestly thought of asking (other writers) before I knew better. Glad I didn’t. You are right, I believe the most important task we have as Bloggers and Marketers is to build quality relationships with fellow bloggers. Doors literally open and opportunities show up from strange quarters when this happens. It’s easier to recommend and give jobs to a blogger you already know than put your reputation on the line by recommending someone you don’t really know. I just thought to chime in and respond to your comment.